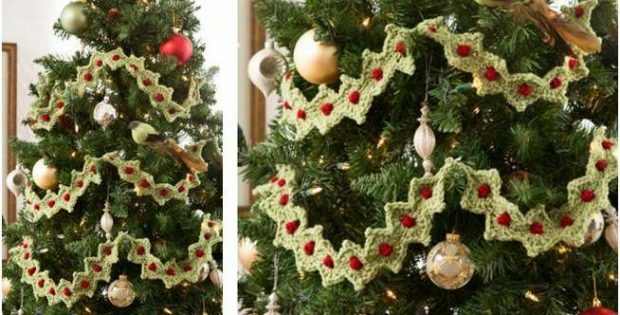 Add more holiday cheer with this crocheted Christmas tree garland. The charming red popcorn berries will definitely prettify your tree! You can also use the crocheted garland to decorate furniture. It’s so versatile, you can use it all year round! In fact, this pattern is a perfect project for confident beginner crocheters looking to make handmade decorations for the Holidays. Once finished, the crocheted garland should measure approximately 38 inches long and about 3 inches wide. In metric measurements, the completed garland should have a length of around 96.5 cm and a width of approximately 7.5 cm. This crochet pattern is a wonderful design by Bonnie Barker. In fact, you can access the FREE downloadable pattern for this lovely crocheted garland with red popcorn berries.